Not much time at school to build and launch rockets? Estes Educator has got you covered! The Firestreak SST is the first ever snap together rocket. It's one of the quickest model rocket kits your students will ever build. This hot rocket is aerodynamically designed for reliable, high-flying launches and great for smaller launch areas. Now you can make and launch a rocket in one class period! Why is it so quick to build? There's no cutting, gluing or painting used when assembling this rocket. 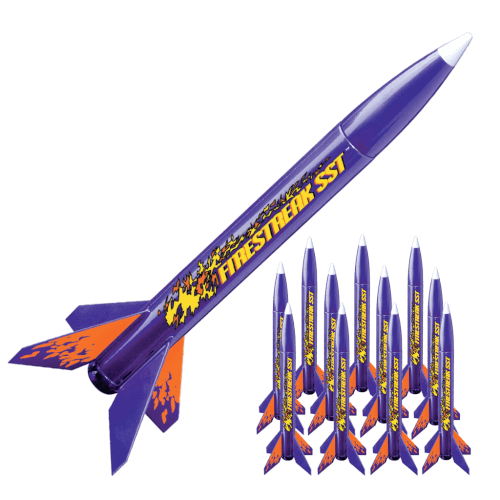 The Firestreak is molded in a bright purple color and features colorful, self-stick flame decals. All you do is match up the pins and notches for the nose cone and body, snap them together, attach the recovery streamer, wrap the decal around the body tube and you've got a rocket! How easy is that! This cloud-topping scorcher uses economical Estes mini engines and can easily reach over 350 feet high. Estes launch equipment also required - sold separately.